Another woman is fanatical about housework, won't have a thing out of place, demanding utter perfection in her house and grooming. 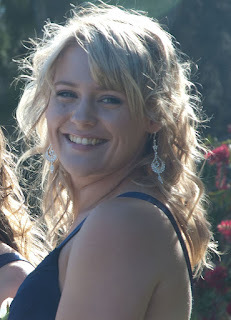 To the point of taking two hours to get ready to leave the house, immaculate down to the last hair. Lots of people would think this is a good thing, but it's not for me. So this obsession gets a tick from some people and not others. 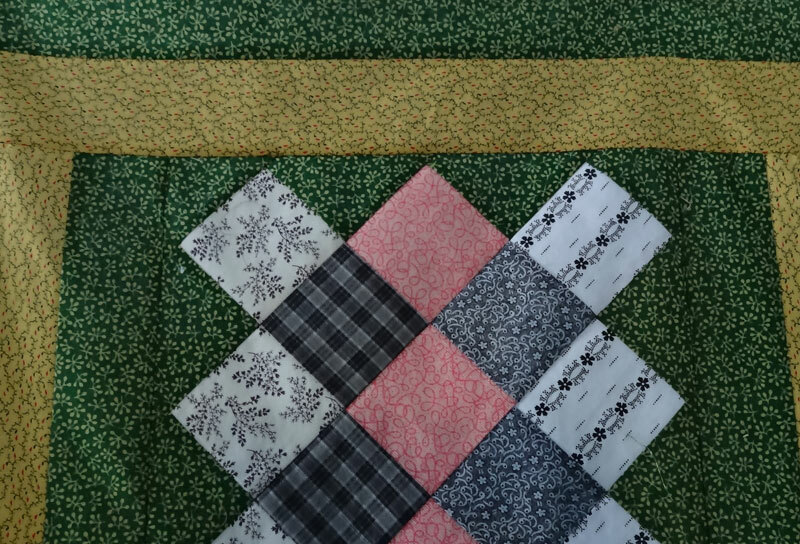 A quilting friend announced on Boxing Day that she was working on a quilt, and added that it would be the last one, she wasn't going to make another one. 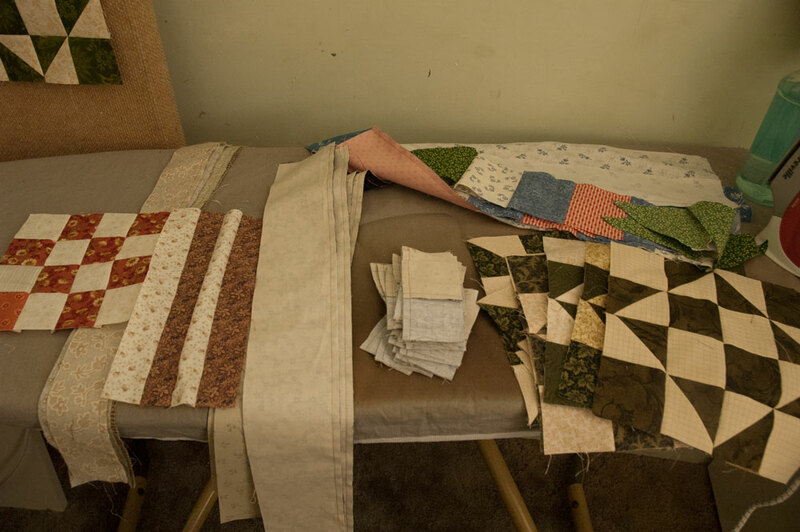 She will turn 80 very soon, and has supplied all her family with quilts for many years. It will be an honourable retirement, but knowing her, there will always be just one more. My obsession? Whatever is on my design wall. I didn't used to be like this, but just lately I can't rest until the project up there is done, or almost done. (I'm still on track for the DJ to be in one piece before the New Year, but it's not up on the wall anymore.) 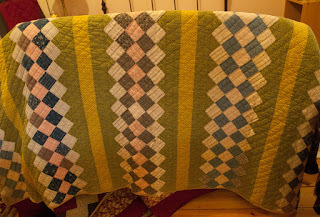 I know I said I wanted the strippy quilt to take a little longer, but that didn't last. I just wanted it done. I can sew for hours at a stretch if I have something good on the TV, and my something good lately has been DVDs of Transatlantic Sessions. They feature a mix of Celtic and Bluegrass musicians, and I just adore them. There are five series, and we own 2, 3 and 5. Next on the list is 1 and 4, and we'll have the complete collection. So I've spent hours and hours in the company of Ally Bain and Jerry Douglas, and now I have a finished top. 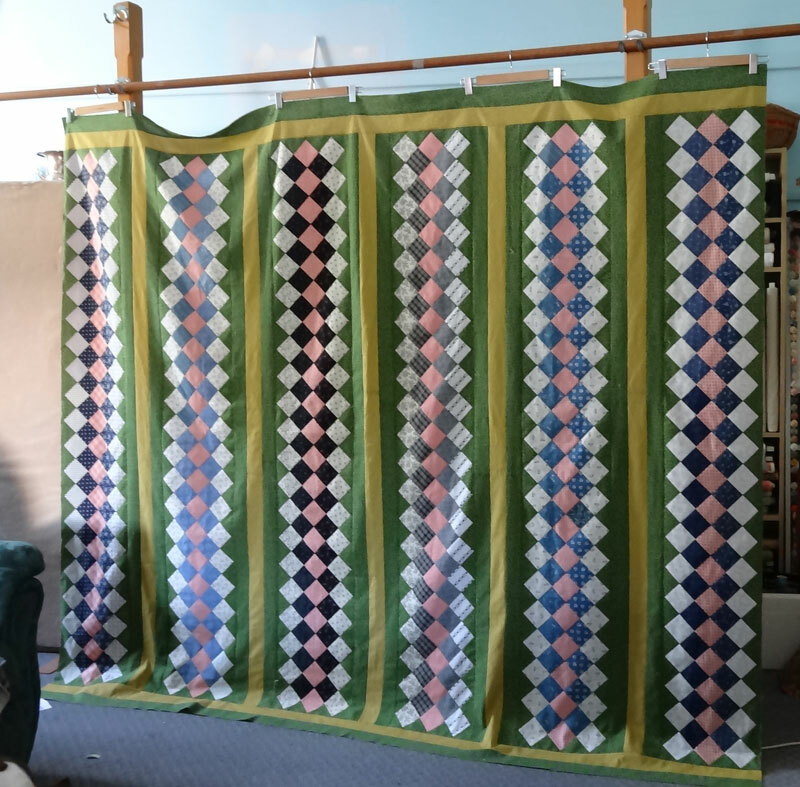 It demanded to be big enough for a Queen bed, which is odd since I have a double; it looks great on the QS bed at the hall, which we use to store our customer quilts awaiting collection. On my bed it comes all the way to the floor on both sides, but it's not too big to use. I'm sure this quilt is destined for a QS bed somewhere, maybe not for a while; at least I won't have that pang of regret 'I wish I'd made it bigger....' What is odd is that I kept thinking, 'This will look terrible in the photo, maybe I shouldn't have added the extra strip, and maybe I should have put borders all round...' It looks good on the bed and that should be my main concern, I can't focus on how it looks on a wall or in a photo. I just love the way the grey, pink and shirting prints look against the green and yellow. I think there will be a quilt in my future with those colours predominating. 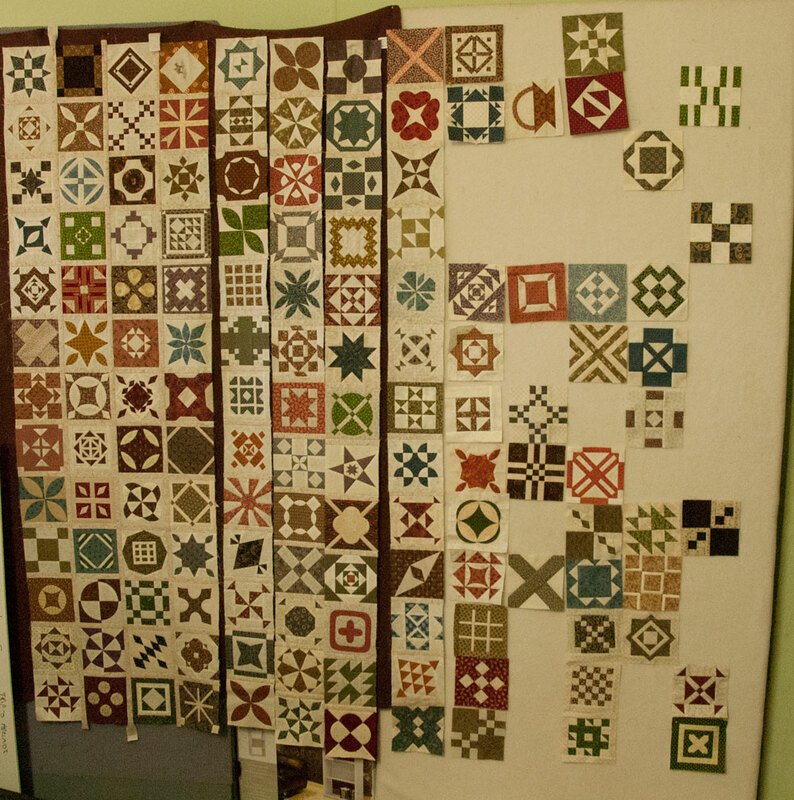 Every quilt I make sparks ideas for a new one. At this rate I'll never be able to say 'Well that's all the quilts made'. 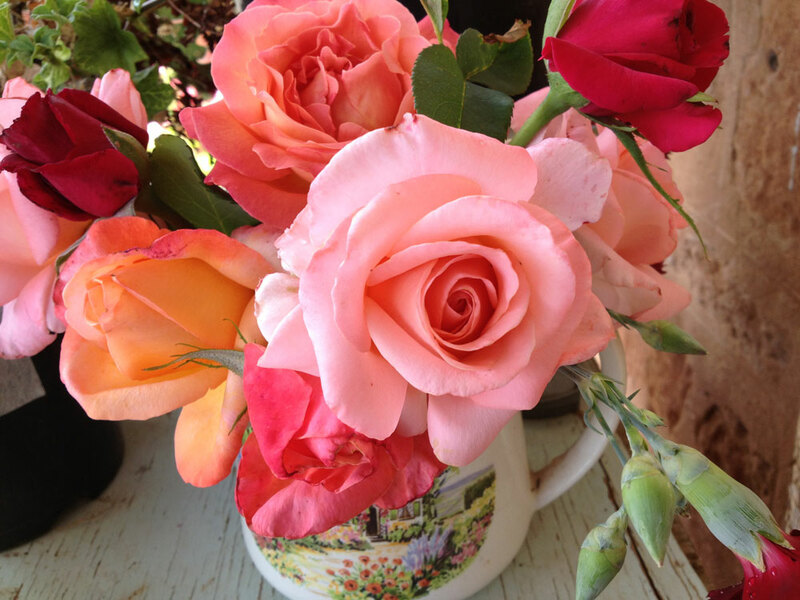 A customer arriving to pick up a quilt looked at my huge collection of potted roses and flowers and remarked, 'But what are you going to do with them all?' Well enjoy them mainly. And also pick many bunches of flowers for my kitchen table. 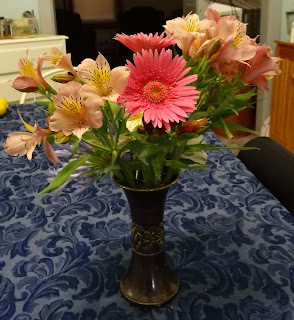 The Princess lillies are loving the early summer heat, as are the gerberas. I think this counts as a good obsession. 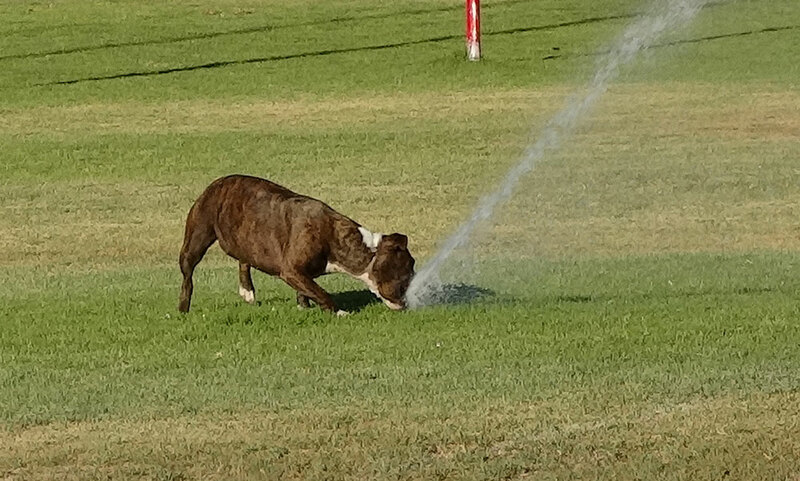 As for Dolly, she has four main obsessions; food, balls, small animals who run away and pop-up sprinklers. 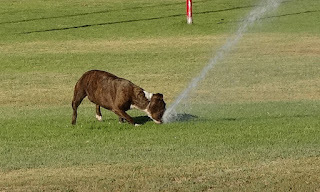 These are the big sprinklers on the football ground, which throw a jet of water 50 feet or more. 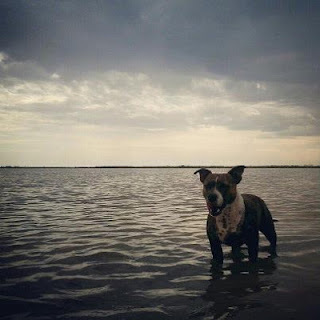 She will bite at the water till she's exhausted; I have to put her on a leash and lead her away. She gets as bloated as a tick with all the water she swallows. This is a bad obsession, but it's funny to watch. 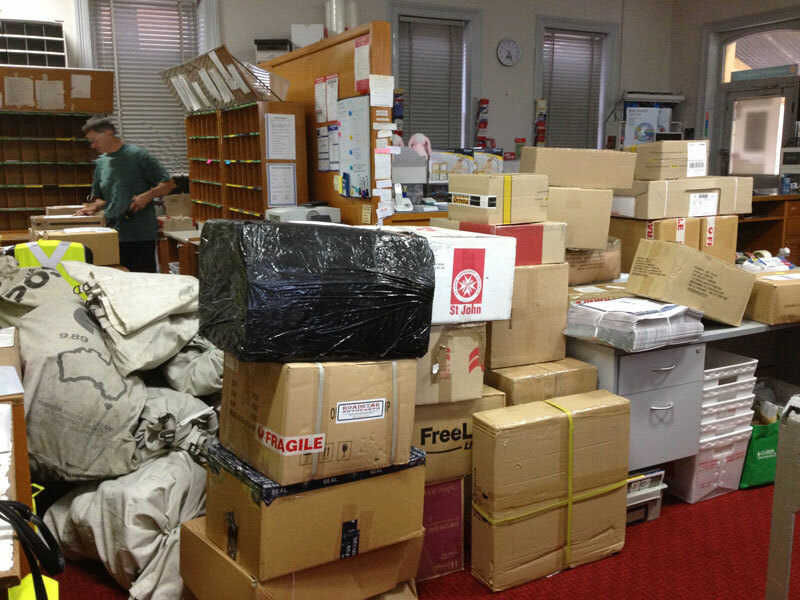 Being a postie at Christmas is a bit of a nightmare, especially in this age of internet shopping and mail order. The parcels were brutal, 20 huge bags full on Monday, hundreds and hundreds of things to be delivered. 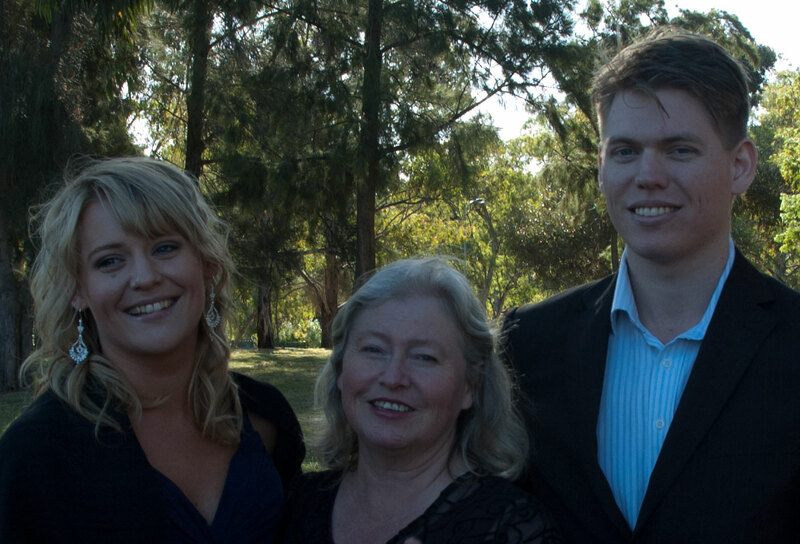 It was a quiet Christmas Day for us, as only Mereth's son Matt was here. Somehow it seemed busier than usual. 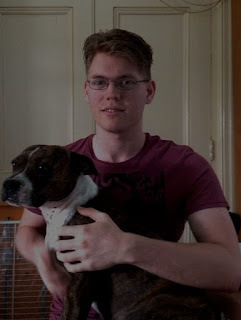 We had a nice Christmas lunch with Matt and the dogs at my place, and watched a DVD in the afternoon. Then it was time to drop Matt home, and go round to the brother's place for Christmas dinner. I came home from there around 9.30 ,and I was too tired to do anything more than sleep. This morning I had to catch up on email and work stuff, then it was time to go to friends for lunch, and we had a thoroughly lovely time. The weather is beautiful, perfect for sitting in their back garden and chatting for hours on end. It was very relaxing. Now it's time to get ready for an evening meal with Liz and John, who are on their way home from Adelaide. I have had only an hour or two to spend alone, the socialising has been great, but means there has been no sewing taking place. And it's back to work tomorrow, delivering all the parcels that didn't make it in time for Christmas. Only two more work days, and then we get a four day weekend. 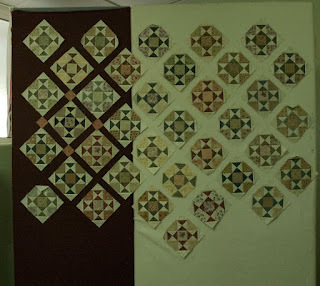 I hope to get the green and yellow quilt in one piece, and most of the Dear Jane assembled. I'm aiming to have both done by New Year's Eve, which is entirely possible. I've started putting the strips together on the design wall, and it should be easy sewing. Next two strips are prepped and ready to go..... 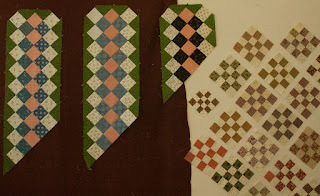 I really love that pink and green and grey combination, I would like to tackle a quilt in those colours. And then there will be a collossal clean up of the sewing area. The place is full of scraps, and I'm not in the mood to be dealing with them. Mereth's going to get the whole lot I think. And she won't complain a bit. I hope everyone had a great Christmas, and that there are relaxing times for all of us between now and the New Year. 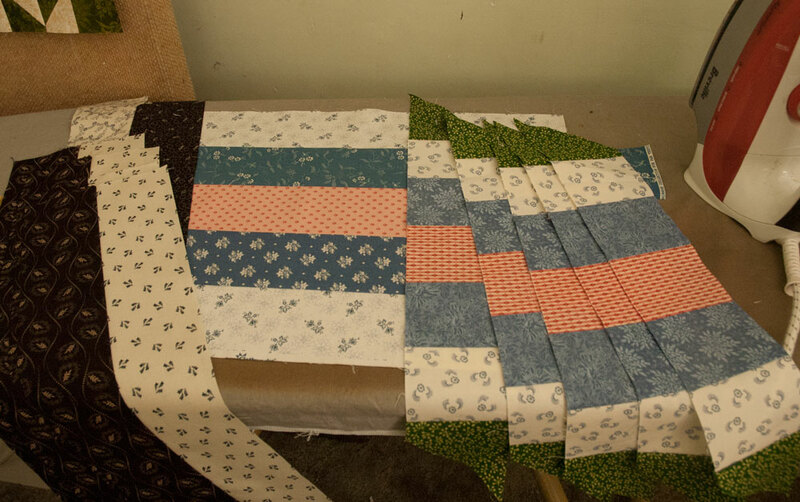 I'm steaming ahead on the pieced strips, and even though I've tried to slow down the end is in sight. 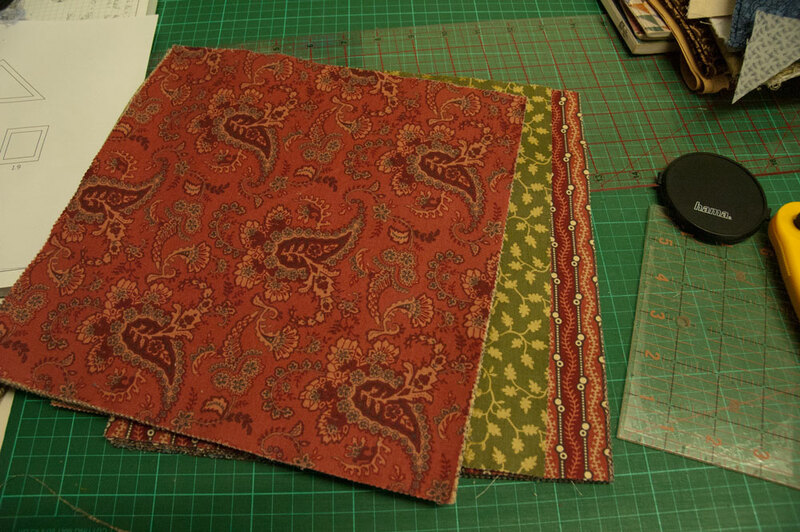 This was a lovely quick pattern to sew, and no agonising over colour placement. I could have made the strips a lot scrappier, but I wasn't in the mood for that, I just wanted to use up the strips I'd cut. 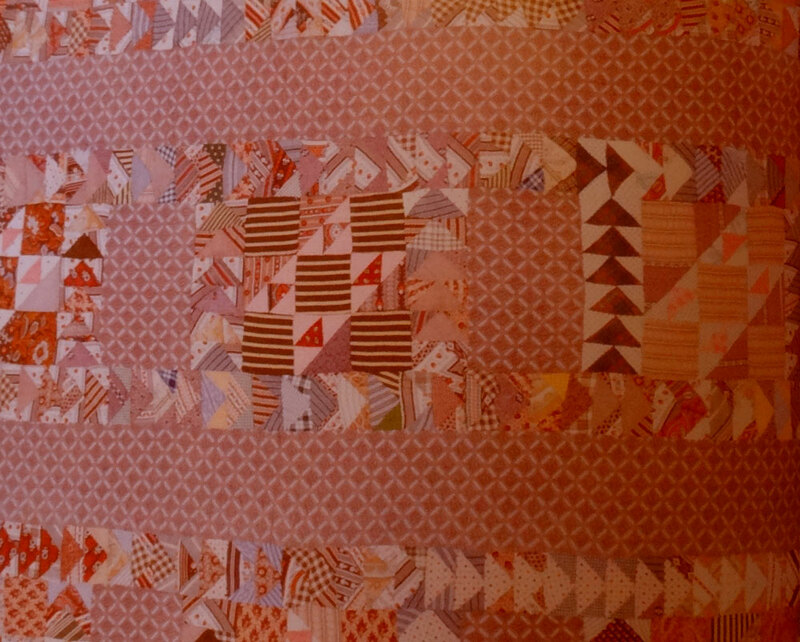 I love the colours in this quilt, and I don't think it suffers from not being too scrappy. 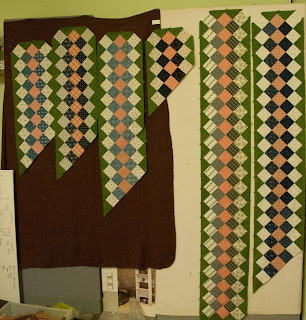 I have only half of one row to do and then it's time to put all the strips together, which will go fairly quickly too. 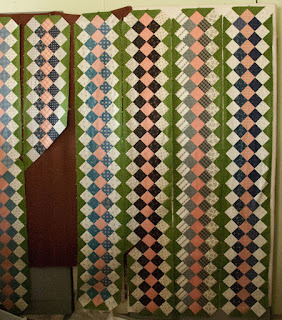 For those who want to try this pattern, the strips are cut 3" wide, and I strip pieced them so that I could slice it into 3" sections. The triangles at the end of each strip are made by cutting a 5.5" square and cutting it diagonally twice. 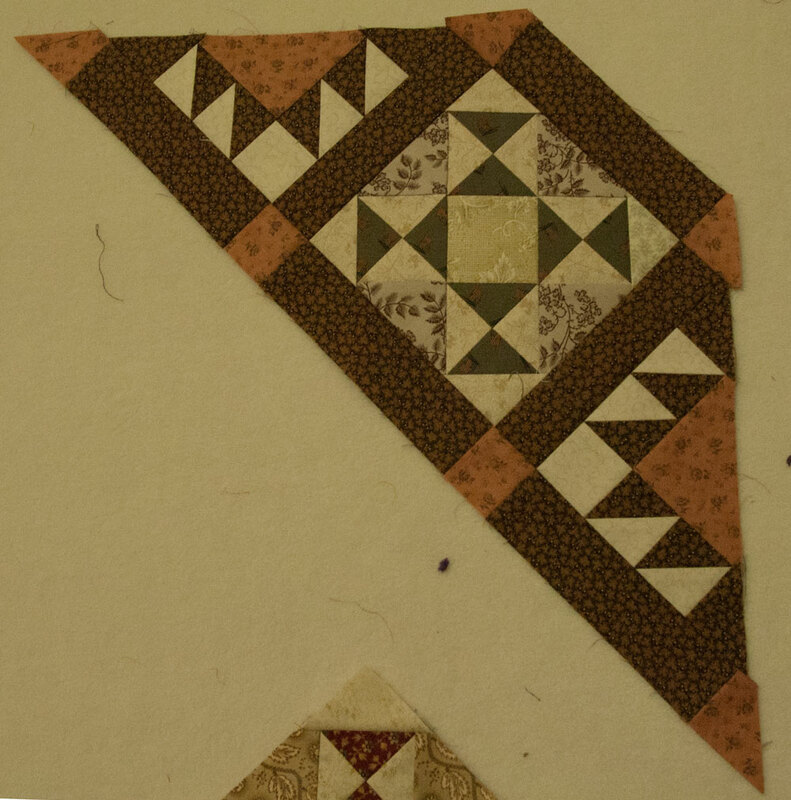 The triangles are oversize, but I just trimmed off the excess as I sewed them. 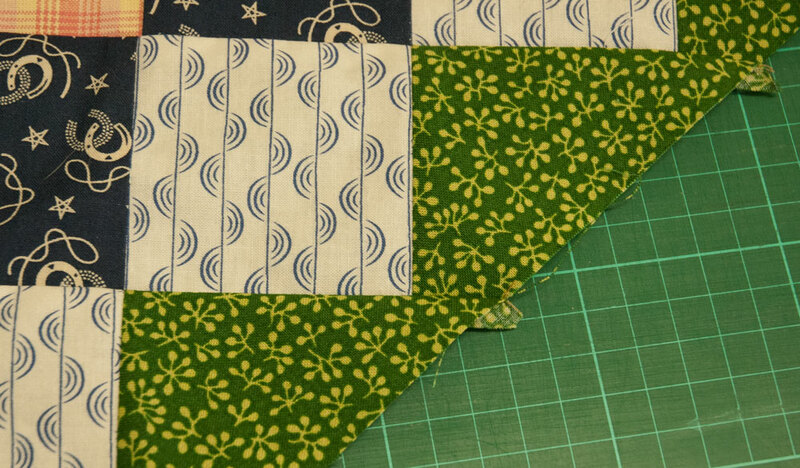 When the strips are sewn togethere there is extra green fabric floating the squares, which helps if you need to even up the edges of the strips later. You won't be cutting off the points of any squares. 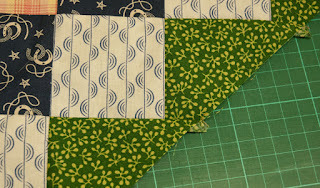 And as a green strip will be sewn to each edge, it will all just blend in anyway. I took a photo of the end of the strip so you can see how easy it is. I'll put a green triangle on each of the corners later, but that will be the work of seconds. I'm more interested in getting all the major construction done first and I'll attend to the details at the end. It's 42 degrees C (107 degrees F) here today, just horrible. On Friday everywhere we went people were talking about the weather forecast for today, about how hot and windy it was going to be and how we'd all have to take care to stay inside and stay cool. Once upon a time we didn't have such accurate predictions, so it was always a nasty shock when the temperature climbed to these silly levels. I much prefer knowing in advance, so I can be prepared, and can get the garden battened down. And now, having finished the last customer quilt for the year, I'm going into my air-conditioned sewing room to really make some progress. The pieced strips in this quilt grow quickly, I have one finished already, and the other five are more than half done. 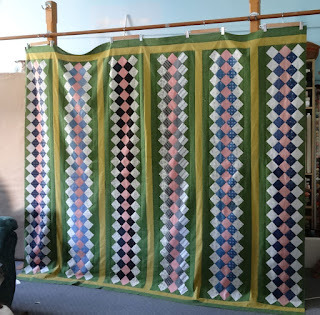 I think I procrastinated about making this quilt for so long because I knew it would go together very quickly, and it would be finished only be a matter of days after I decided to start it. I'm stretching the sewing out a bit, I don't want it over too soon. 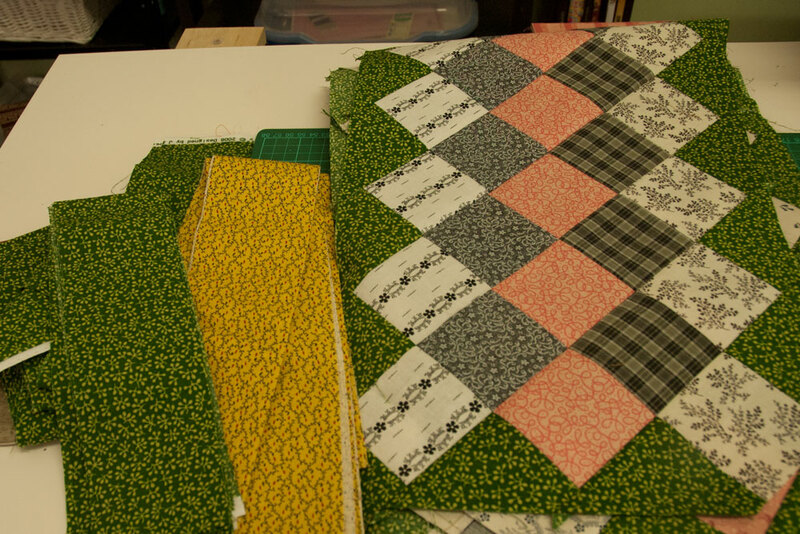 Some quilts go together so quickly I have no memory of making them, and I don't want that to happen with this one. 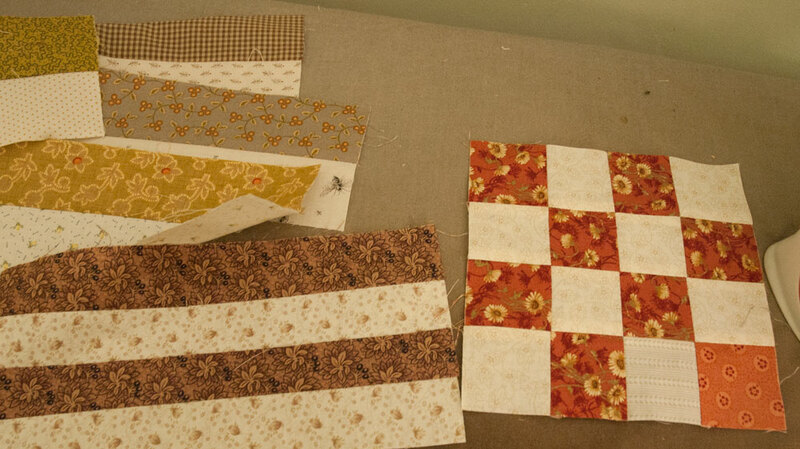 I love sewing these strip set together, it's fast and easy and I can watch the TV while I sew. The 3" strips are fun to work with after the 3/4" ones in some of the DJ blocks. I'm trying to formulate a few pre-New Year's Eve resolutions, things to be working at before the end of the year arrives. I want the DJ in one piece, which is totally feasible. 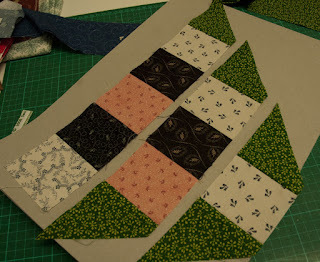 I would like this strip quilt top finished, again, totally do-able. 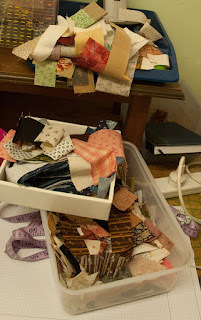 I want my sewing room restored to order; that's a bit of a tall order, but a single night of determined sorting would make a huge difference to the mess. I have DVDs, and red wine; it could be a lovely way to spend an evening. And I would like the UFOs all in one spot, and catalogued so I know what is there. 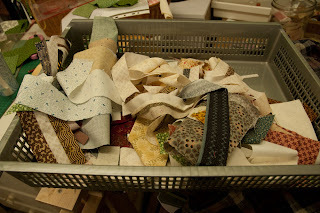 It's all a big jumble now, and I have no idea what I could work on next, ot what is close to completion. I need a list, and a rough outline of what to do next for each project. I like the idea of working my way to the end of the year, trying to make every day count towards my goals, instead of coasting along with the attitude that I'll see out the year and then make a fresh start. I could be in a much better place with my projects in two weeks time, if I just apply myself. Mereth and I won't have anyone here for Christmas or Boxing Day, so we'll be able to do exactly as we please, which sort of compensates for the lack of family. Sort of....... but not entirely. Where's that red wine? 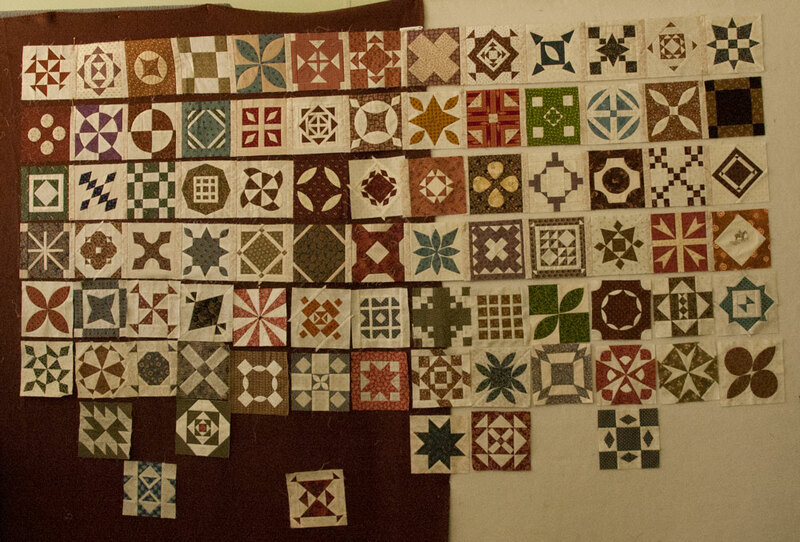 I packed away the Dear Jane blocks,clearing the design wall and allowing something else to be put up there. I was so excited to see the blank wall that I went a little mad, sewing haphazardly on three different projects without waiting to tidy away the debris scattered over every surface. I sewed like a crazy woman for two hours, then sat down and ironed it all and debated about what to concentrate on first. In the centre of that lot are 35 grey and shirting fourpatches for Bonnie's Easy Street mystery, which Mereth asked me to make about three weeks ago. Done now. 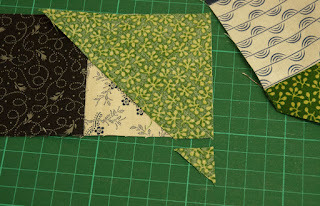 There's another 6 of these green and cream blocks to add to the pile. I only have three kits left of them, so I will have to rustle some more up to use as leader-enders. I have no idea what to do with these blocks, but I'll investigate setting possibilities in EQ7 soon. They are still fun to make, but the controlled colour scheme is so boring (yawn). I remembered my 16patches from last year, so I made another 6 of them, and sewed up the strips for a lot more. They are so easy and cute, but..... Maybe they'd be even cuter if they were smaller; strip set of 1" finished strips included for comparison. Maybe too small; might just have to try 1.25" finished and see if that's the perfect size. I'm very Goldilocks in my approach to designing. 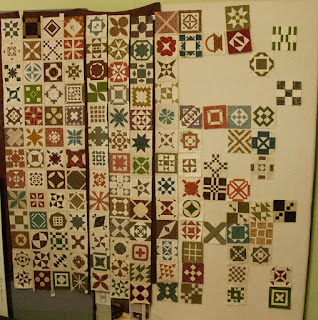 The quilt I'm aiming to repoduce is this one, and copying it has been on my list for more than 10 years. I bought it on Ebay, from a very concientious seller. I paid $37 for it, and then she emailed me that she was so ashamed of it's condition that she couldn't sell it to me. I protested hotly that I wanted it anyway. 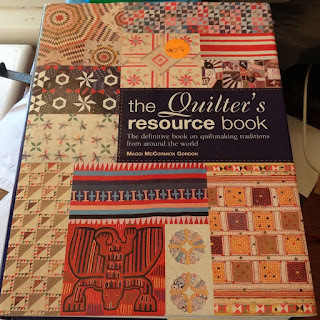 When it arrived, there was a cheque for $15 in with it, to assuage her guilt at me having paid so much for such a rubbish quilt. It has some stains and a few worn spots, but it's still lovely, and totally worth what I paid for it. I might put an extra row in, and it might be black and pink, or it might be grey and pink. My onboard computer will process that while I work on the other rows. My DD came to stay for two days, it was so lovely having her around. We made gingerbread cookies again, but it was so humid they kept going soft, so we couldn't decorate them. We were forced to eat them instead, so there will have to be another baking day before Christmas. 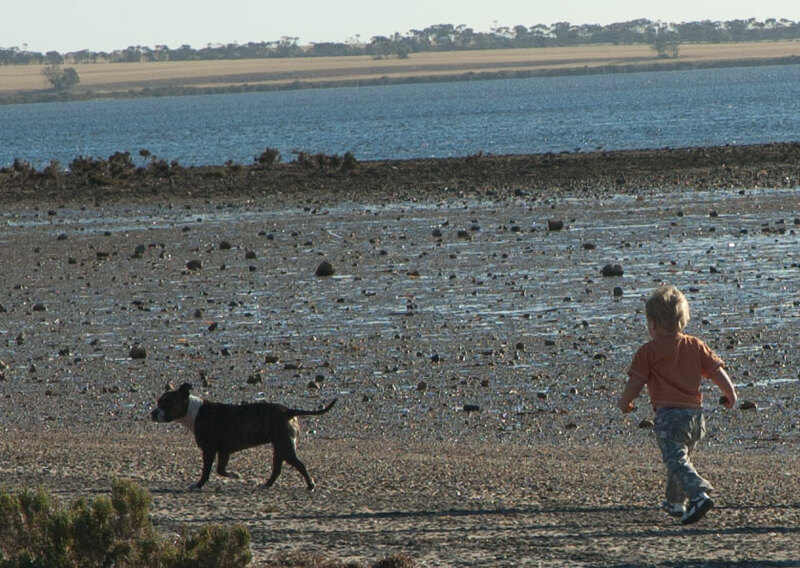 It was so horribly hot that we made a quick trip to Port Broughton so the dogs could have a swim and cool down. 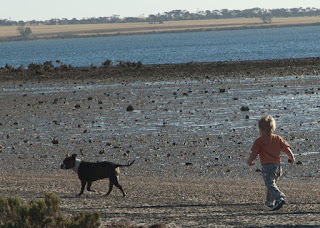 Shonny took them out into the water, which made them cooler, but then they spent the rest of the time galloping about and making themselves hot again. And Oh the Indignity! 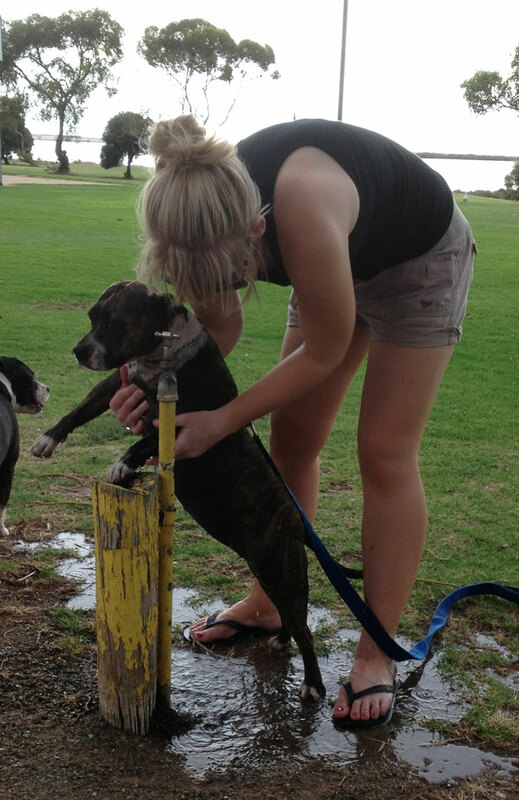 of having your belly washed at the tap in the playground. The downside of living in a tiny town is that there aren't enough jobs for young folks, so it's not likely any of my kids can come and live closer. That's why it's been special having my nephew John, and his wife Liz, living in the next town. We've had weekly get-togethers all year, and I've loved it. The good news is that John has accepted a permanent place at the school as an art teacher, so they will definitely be here next year as well. I see more family dinners in our future. Summer is starting early this year, we've had some nasty hot, dry days already. 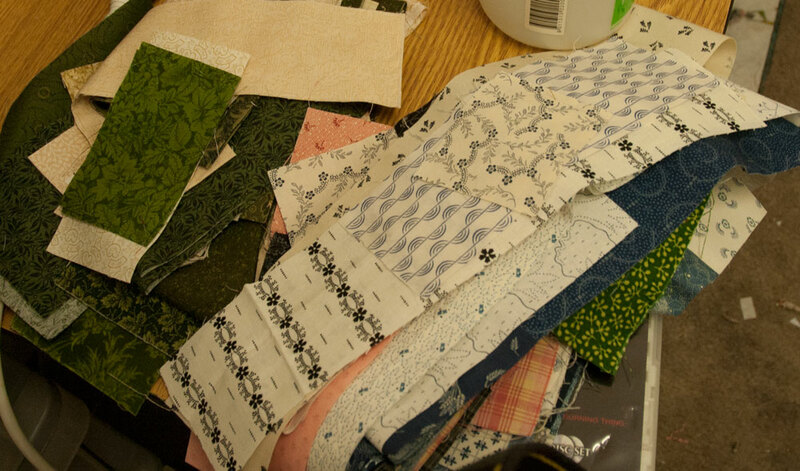 After I've watered my garden and tried to protect all the delicate plants from the scorching sun, I retire to my sewing room and work on the Dear Jane. I was going to have 6 rows completed before I packed it away again. 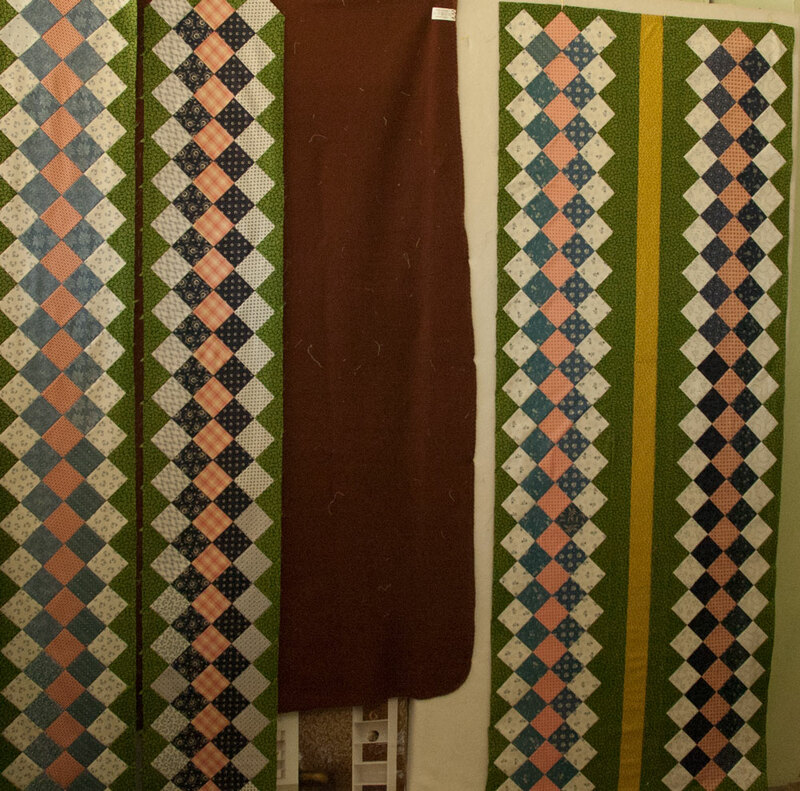 However, I actually had 5 complete rows already, and it seemed a bit wimpy to just make one more row. So I decided I would have 9 rows completed before Packaway. As I pieced the blocks for rows G-I the easy blocks in the remaining rows kept sidetracking me, delaying Packaway date. 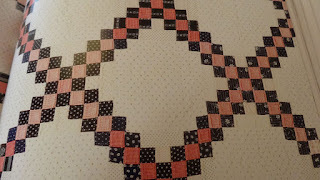 Finally I caved and admitted that I wanted to get the whole darn thing finished and off the wall, so it was full steam ahead on any block that appealed to me. 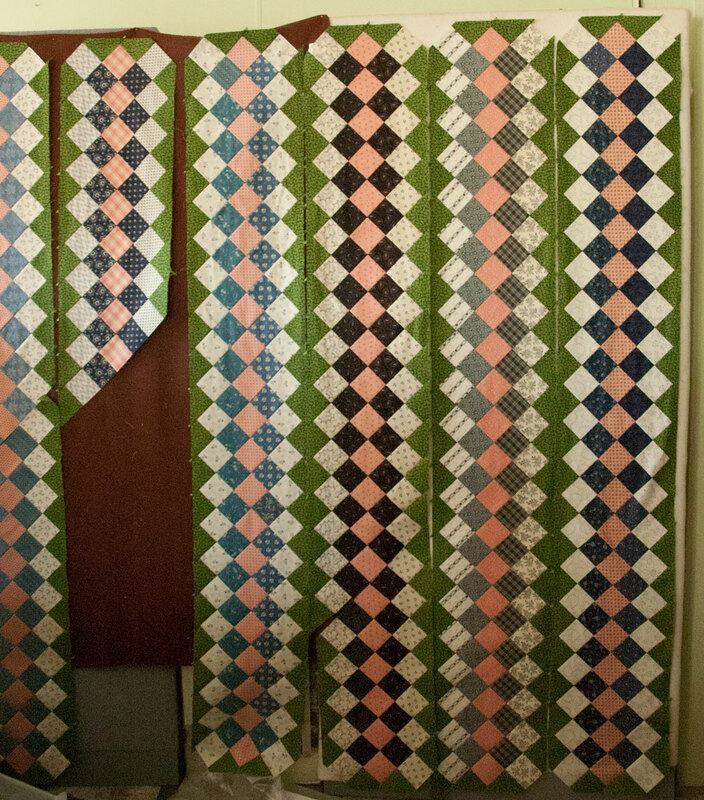 So the current status of my design wall is 7 rows pieced with sashing strips (the 4 rows at the left are joined together in one piece, pretty exciting) and 25 blocks yet to piece. My room is a shambles yet again, but this is the final 25 blocks, kitted up and ready to go. 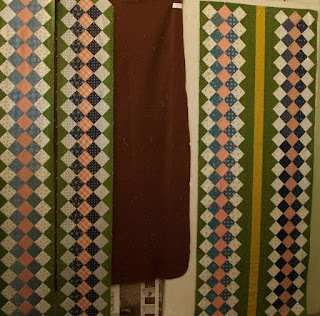 I'm going to give Mereth all the miniscule scraps, put the sewn strips on a hanger till I get all the blocks completed, and start working on another project that needs to be completed. 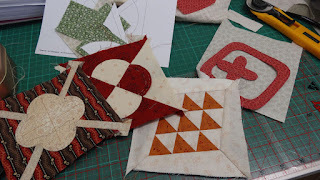 I do love the Dear Jane blocks, but they do my head in; I can't stand the confetti and the paper piecing doesn't allow for chain piecing, and I miss that. I'm pretty sure the next thing will be the grey quilt, now that my fabric for the sashing is here. I hope it looks as good as I imagined it would, or I'm back to square one. 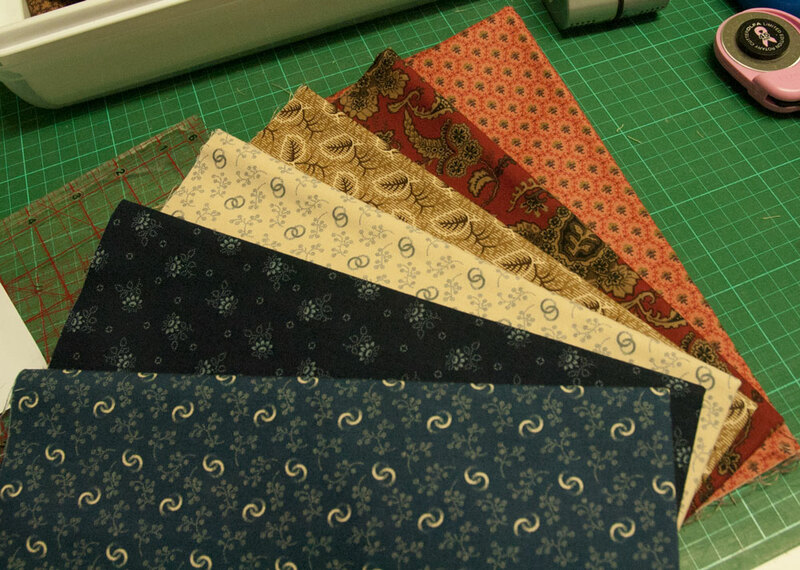 The fabric I bought to fill up space in the mailing envelope is pretty nice, I'm admiring that daily and wondering what I'd like to do with my massive collection of blue prints. Mereth and I discussed the weighty problem of Bonnie's new mystery, Easy Street. We couldn't use her colours without buying a whole heap, which we're not going to do, so we came up with our own version in traditional repro prints. We're going to share the sewing, and the finished quilt. Bonnie's mystery is such a lovely tradition at this time of year, it adds to the excitement of Christmas and the holiday season. Thanks Bonnie! I'm slowly getting back into sewing mode, working for two hours on one small block, but happy to be taking so much care with the details. Sometimes I want to sew up a storm and get a pile of blocks done quickly, but slow and painstaking is what suits me now. 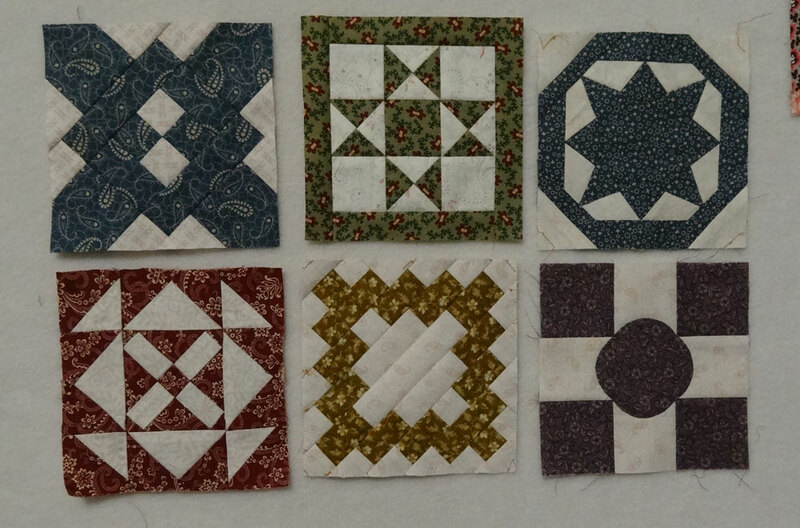 I have 6 new blocks on the design wall, and 5 more prepped for hand work. It feels great to be making progress again. While I work slowly on this project I can ponder what to start next. When we were at the Central Markets in Adelaide we visited the secondhand book stall. Mereth insisted I buy this book, even though the weight of it gave me second thoughts. I made DS Rhys carry it while we finished the rest of our shopping. It's got some lovely quilts pictured, with detailed full page photos. 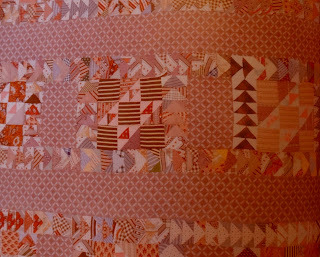 I'm still drawn to chain quilts, and to double pinks and indigos. And this block is unusual; I already have 5 of the centre Double Anvil in my Orphans box, and I could make Flying Geese units to surround them. This definitely has possibilities as my next project. I love being able to add wonderful books to my library. Once the hot weather gets here and we're trapped indoors in the airconditioning I can get out a stack of books, my notebooks and graph paper and spend the hours with my favourite antique quilts. With a pot of tea. And some fruitcake. Sounds good. I had no idea what I wanted to work on first, so I went back to an old project, one I'm keen to see closer to finished. My Dear Jane has languished for more than three years, but it's time to revisit it. I can't believe I actually made some of these blocks, they are so complicated! 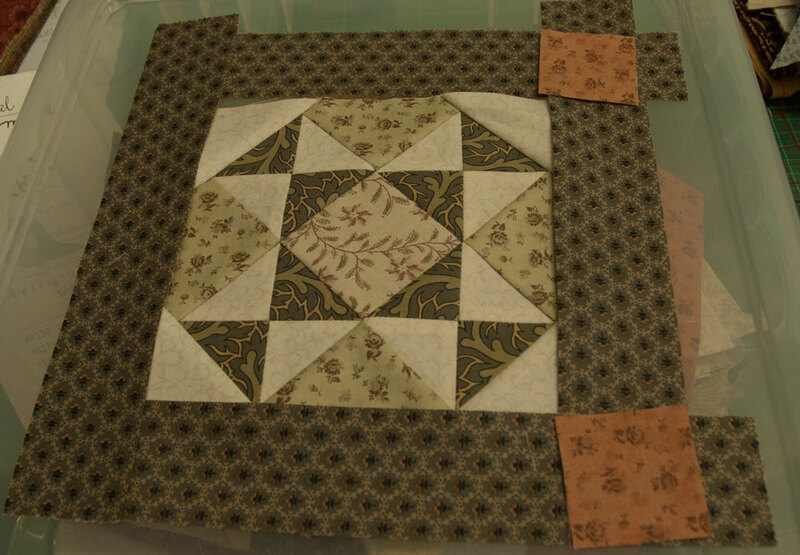 I still love it, and I'm enjoying working on such a small scale, but all I've managed to finish after a day in the sewing room is one block. I have 9 others in various stages, just needing a little bit of hand work, but nothing ready to take it's place on the design wall. All that blank space on the chart is daunting, but I know from past experience that the only way to do this is one block at a time, one row at a time. I will get there eventually. The ugly ones are still annoying me though, especially the reeeaally complicated ugly ones. What were you aiming for with this one, Jane? This one would be much nicer if those outer units touching the square were Flying Geese, so I think I will make that minor amendment. I just won't tell anyone. This one is ugly, but it won't be hard to piece, so I'll probably just make it without changing anything. Seems I just resent effort+time=ugly. 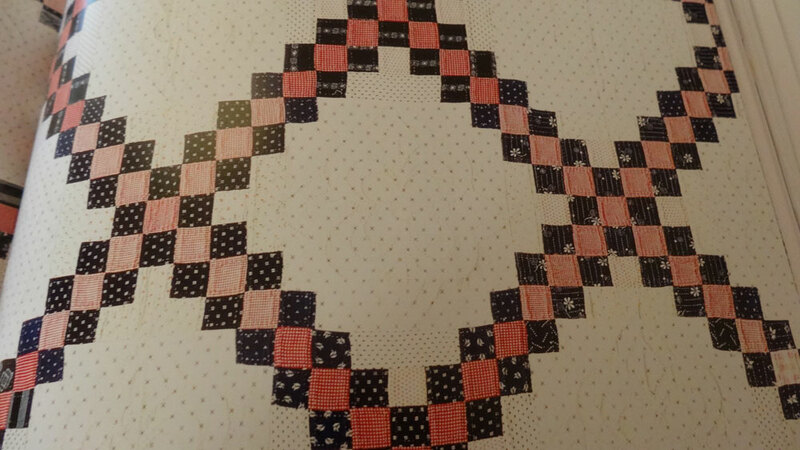 May I just say that I would never contemplate making this quilt without the Dear Jane software. (Lots of stuff on this site too.) 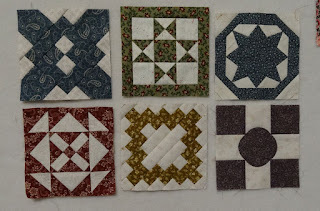 It would take a lot more time to draft up these blocks from a book, and my enthusiasm would wane before I was ready to start sewing. 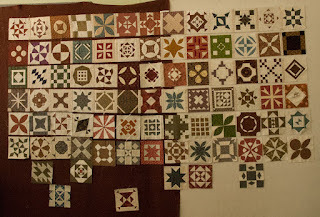 The software is great (some of the blocks still require creative input, but at least the line drawing is there) and I know I will use it to resize some of the nice blocks to make other quilts. Maybe I'll make the ugly ones and put them on the back, and substitute a block of my choice on the front? At least I have the sashing strips attached to the top 4 rows, that helps keep everything organised. My aim is to have 9 rows sewn together in one piece before I pack this away again, so there won't be much to do next time I choose to work on it. 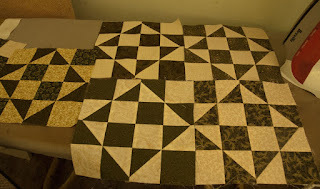 That's 28 blocks I need to make, but some of them are easy. I think I could have that done in two weeks time, and by then my grey Metropolitan Fair material should be here. And then Bonnie's mystery will start; am I going to do it this year? I'm tempted. I'm insane to think of adding to the workload. I'll probably do it anyway. It's November already, only a few weeks left in the year, so I'd better start blogging regularly from now on. It's coming up to the busiest time of year for the postie work, lots of parcels to deliver and endless catalogues. The quiet time in the new year is the only thing that makes this job bearable, there is an avalanche of parcels due to Ebay and online shopping and we put in many extra hours in the run-up to Christmas. We desrve to have it easy later on. The hot weather is coming, but that's OK, because then I will have to stay inside and sew, it will be too hot to be outside. 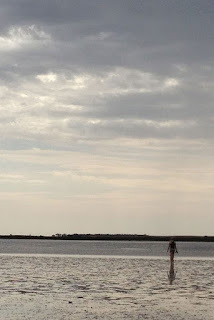 There are many things I hate about summer, but I'm choosing not to think about them just yet. I think I can start clearing my sewing room today, it's like a jumble sale in there now, with every homeless object from the last 6 weeks just dumped on the tables. People helped clean up after every meal, and if they didn't know where something lived, it just went into the sewing room. It was such a shock to have 7 people around for three days, after my solitary existence, but we all enjoyed ourselves. I discovered that I only have 7chairs, which was awkward when the numbers swelled to 9, but we made do. It's all about the company, after all, not whether it's worthy of Home Beautiful. that the truth became clear. I didn't like the sashing material I'd chosen, and I realised that when I saw this grey foulard print. It was perfect, exactly what I had in mind and couldn't find before. So all the blocks were packed away yet again, while I waited patiently for the yardage to become available. This morning I ordered it, so I'm keeping my fingers crossed that it's here soon, and I can get this project finished. Cleaning up will take up most of the day, but hopefully there will be some sewing this evening. I could not begin to describe the last 6 weeks, it's been a whirlwind of activity, just one thing after another. 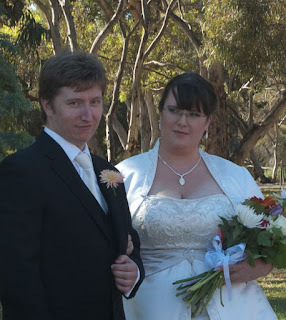 My mantra has been "I can do this...", and seeing it's all over now with no disasters, I guess I did do it. Now it's time to pick up the pieces, and do the laundry. 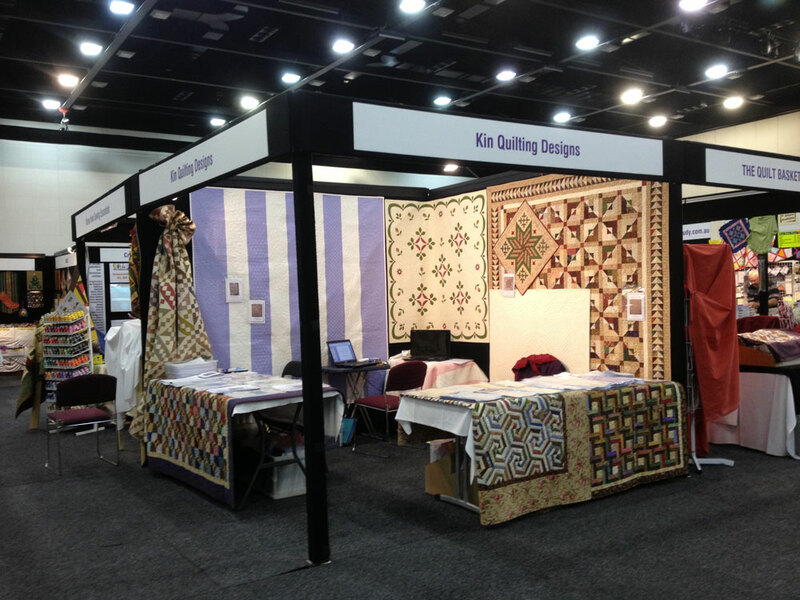 There was the booth at the Austalian Machine Quilting Festival. Dolly adored him, she will be very sad now that he's gone back to Queensland. 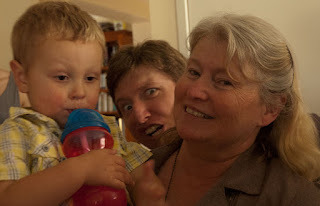 There were birthday festivities for our 54th birthdays (must update profile) It was so great to have most of the family together in one spot. None of us could keep up with the almost-2-year-old, only the dogs could match him for energy. A long trip back home. 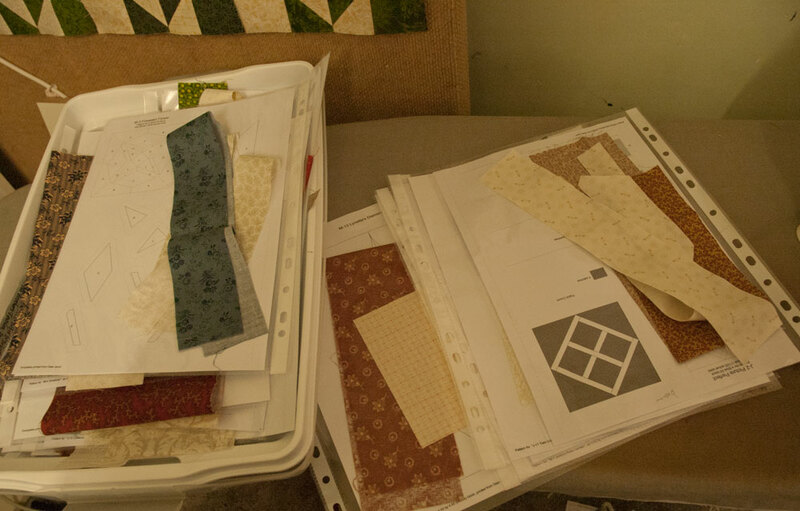 Now I have to put my house back into some semblance of order, get all my work stuff sorted, and then try and remember what the heck I was trying to achieve in the sewing room. I think I might actually stitch something in the next day or two; it will be wonderful to have time to sit and sew again.